This super spacious HugglePod has room for the entire family to get away and hang out! Designed with light-weight aluminum tubing and thick, weather-resistant nylon, this HangOut is especially durable and easy to hang. Includes a comfy quilted floor mat and a string of easy on/off LED lights to add ambiance inside the Pod! String lights require three AA batteries; batteries not included. 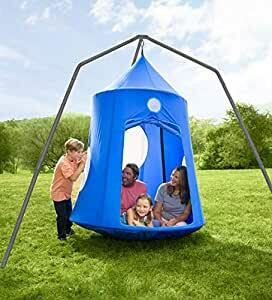 The Nylon Family HugglePod Hangout measures approx. 78″H from the 60Â½”-diam. bottom O-ring to the top O-ring. Spot clean only. Holds up to 500 lbs. The Nylon Family HugglePod Hangout and Family HangOut Stand Special includes our custom-crafted, easy-to-assemble Family HangOut Stand (approx. 8Â¾’ x 8Â¾’ x 8’H; holds up to 600 lbs.) so you can safely hang your HugglePod wherever your family goes! For ages 3 and up.